To put it in plain English, FairMining.cc makes your computer a mining machine. If you haven’t read it yet, check out our general introduction to mining and why you should avoid all Bitcoin mining. What profit can you expect to make with Fairmining? Between 1 to 3% per day is the ROI you will allegedly enjoy, if you sign up with Fair Mining. 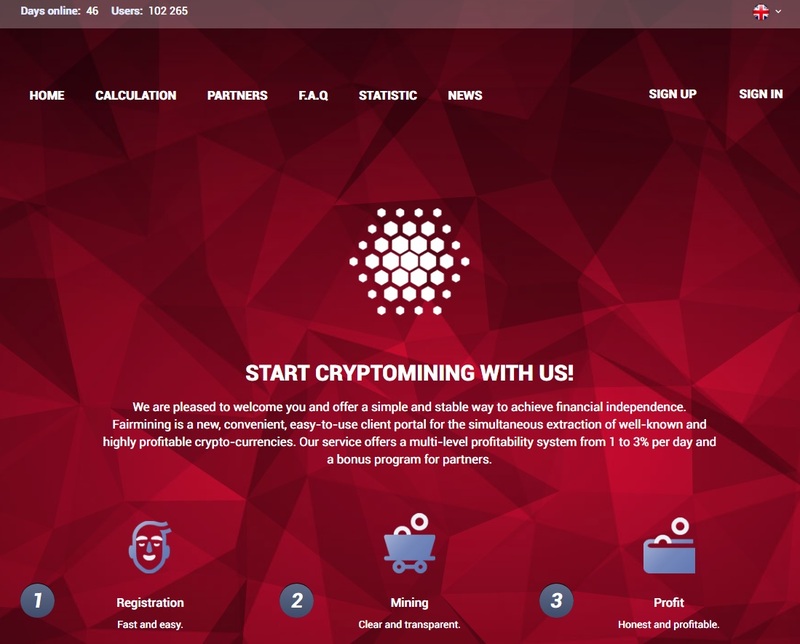 Fairmining actually uses a level system where beginners start with up to 149 Ghs and can make a profit of 1% per day at level one up to level 10, where your Ghs is 1000000 and profit is 3%. A daily profit calculator is provided on the site. Investing $1,000 will get you a 100000.00 GH/S and a 2.4% profit, namely $24 per day or $720 per month. You will get 814223.00 GH/S if you invest 1 BTC, and this will lend you an impressive 2.8% profit, or almost 1 BTC per month. With the price of Bitcoin at time of writing this being $7.5K, this is not a bad monthly salary. And it’s a passive one too. Sounds like a dream, right? They also seem to accept Litecoin and Dogecoin. No information regarding the owners of Fairmining.cc is provided on the site. Unsurprisingly, the ICANN information of the domain is hidden through a privacy protection service. According to Whois.com, the domain was registered on April 7, 2018. It’s expected to expire in one year from that date. It should be obvious that you should NOT send money to any website which uses a privacy service and doesn’t reveal its real contact information, including physical address and telephone number. According to FairMining.cc, 102,048 users are currently enrolled with the service. We doubted it too until we found that FairMining.cc received a staggering 1.23 million visitors during its first month of existence, according to SimilarWeb.com. Most of the visitors seem to reside in Brazil, Russia, Ukraine, Venezuela and Indonesia, which indicates that these are the main countries targeted by the perpetrators of the FairMining operation. Indeed, the site is available in English, Spanish and Portuguese. According to Alexa.com, the site also targets people from Italy and Germany. They seem to be deriving much of their traffic from ad promoting sites, such as adbtc.com and mellowads.com. They are also monitored by various “HYIP monitoring sites,” but we’ll get to that later. Fairmining offers a “bonus program” for partners who want to introduce the company to their friends and followers. You get 5 GH/s for each registration done from your affiliate link. So you receive 7% of the amount of GH/s purchased by the clients you bring. Judging by the amount of referral links we were able to find in many very high rated sites, we would say this strategy worked out pretty well for FairMining. It took them less than 2 months to become a very highly ranking domain. Minimum deposit is 1 USD, 0.001 BTC, 0.1 LTC or 1,000 DOGE. Perfect money, Payeer, AdvCash payment systems are accepted. Minimum withdrawal is 1 USD, 0.002 BTC, 0.1 LTC, 3,000 DOGE. If you want to withdraw your earnings, you will need to wait anywhere between 1 and 48 hours for your request to be processed. The principal, which is the amount you invested, can NOT be withdrawn. On May 2, 2018 the owners of the site reported a DDoS attack directed at their server. While the site was inaccessible during the attack, the mining process continued as usual. FairMining stated that they “took appropriate measures to ensure that this did not happen again.” Indeed, they seem to be using Cloudflare now for DDoS protection. Is FairMining Really Fair or is it a SCAM? We were able to find very little real user reviews/feedback in English. The only “testimonials” we have found either had an affiliate link attached to them, making them unreliable, or just said that a $1-5 withdrawals were successfully made. In the above screenshot from FairMining.cc, you can see the sort of amounts people are able to withdraw. It might be a waste of time to get involved with FairMining considering the low payouts, however it’s the same issue with most crypto mining services. Since we didn’t find any evidence of theft, we currently don’t believe it’s a full-blown fraud. However, it’s definitely highly misleading. Would you recommend FairMining to your best friend? *Comments with affiliate links will NOT be approved! fairmining.cc server IP address could not be found. It is fk SCAM!!!! dont invest!!!! I also did not receive any payment after withdrawal. it’s really really really scam bacause I am victim. till now not receive my payment.